Increases should be viewed by labour and employer stakeholders as fair. There is currently no formal process established in Ontario for increasing the minimum wage on a regular basis. The minimum wage is not tied to any economic indicator. Throughout its history, the minimum wage has been subject to a series of periods of freezes and ad-hoc increases. 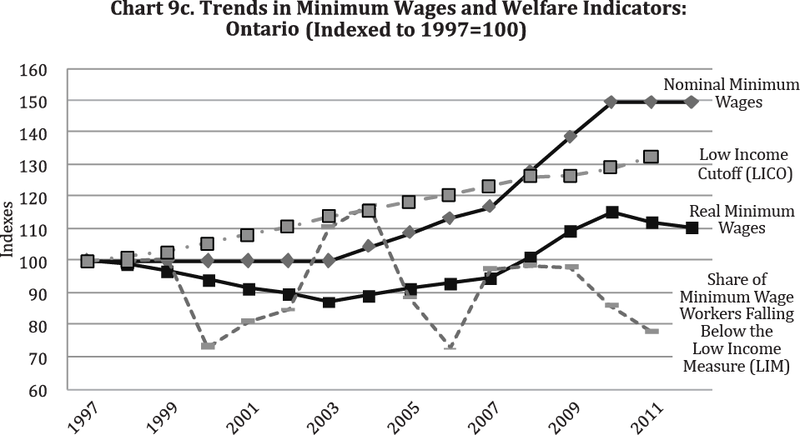 Recently, the minimum wage in Ontario was frozen at $6.85 an hour from 1995 to 2003. From 2004 to 2010, the minimum wage was increased in two pre-determined series of steps: first from $6.85 to $8.00 in four steps and then from $8.00 to $10.25 in three steps. The current level of $10.25 an hour has remained unchanged since March 31st, 2010. A number of other jurisdictions have begun to add greater structure to the process of revising the minimum wage, through the use of economic indicators for annual, formula based increases, and yearly or multi-year review panels. In recognition of these changes, the Government decided to review its own process through the establishment of a Minimum Wage Advisory Panel (the Panel). 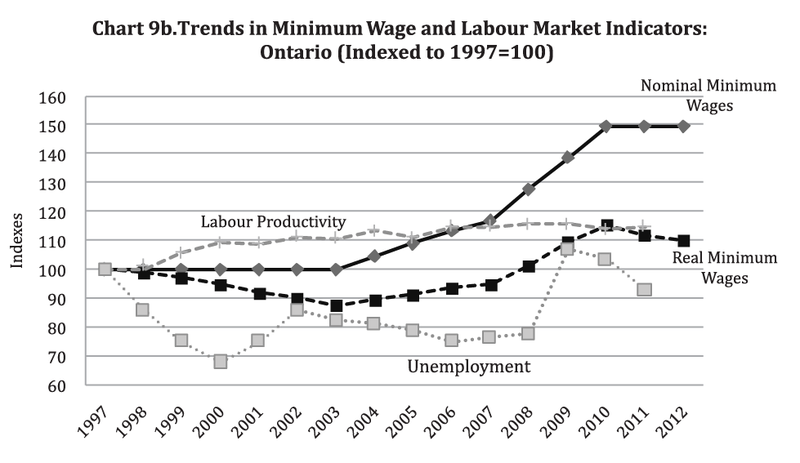 2.2 Statistical Profile of Minimum Wage Work in Ontario. 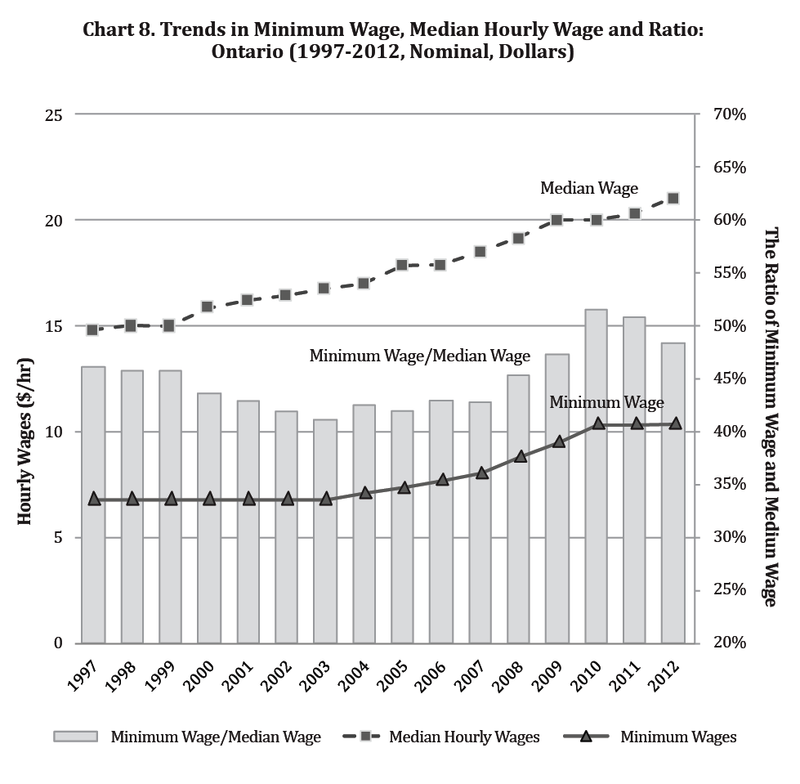 The following section sets out a statistical profile of minimum wage work and workers in Ontario, through a series of charts, figures and summaries. Three industries, accommodation/food services, retail trade, and agricultural industries have the largest percentage of their workforce employed at minimum wages: 39%, 24% and 18% respectively (Chart 1). Minimum wage workers are disproportionately concentrated in two industries: retail trade and accommodation and food services. The retail industry employs only 12% of the total workforce but it accounts for 30.7% of all minimum wage workers in Ontario (Chart 2). Similarly, the accommodation and food services industry employs only 6.7% of the total workforce but it employs 28.4% of all minimum wage workers. Together, the retail industry along with accommodation and food services accounts for nearly two-thirds of all minimum wage workers even though these two industries employ only 18.7% of the Ontario workforce. 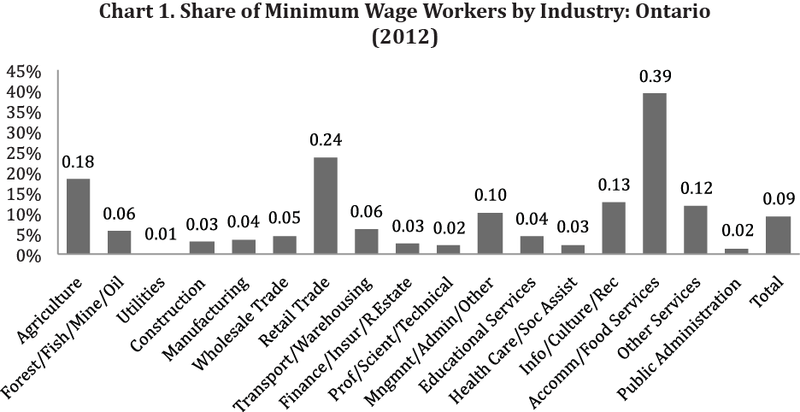 All other industries that employ 81.3% of all workers account for only 40.9% of the minimum wage workforce. In terms of age, the youth stand out as a group among minimum wage earners. Youth in the 15- 19 years age group are only 4.9% of the total workforce but they form a solid 42.1% of the minimum wage workforce (Chart 3). An older young adult group, 20-24 years, is also overrepresented but not to the same extent. They form 10.1% of the workforce but nearly 19.7% of the minimum wage workforce. Conversely, working age adults in the 25-64 age groups are underrepresented. They constitute: 82.8% of the workforce but 35.6% of the minimum wage workforce. In absolute terms, adults between the ages of 25-64 make up a large portion of minimum wage workers. Stated another way, one in three adults working at the minimum wage is in what is considered to be the prime of their working careers. This incidence of minimum wage workers between the ages of 15-19 has increased significantly from 2005, following a slight decline from 1997-2003 and a spike in 2004 (Chart 4). From 2011 to 2012, the incidence of minimum wage workers between the ages of 15-19 has stopped increasing and appears to be leveling off. 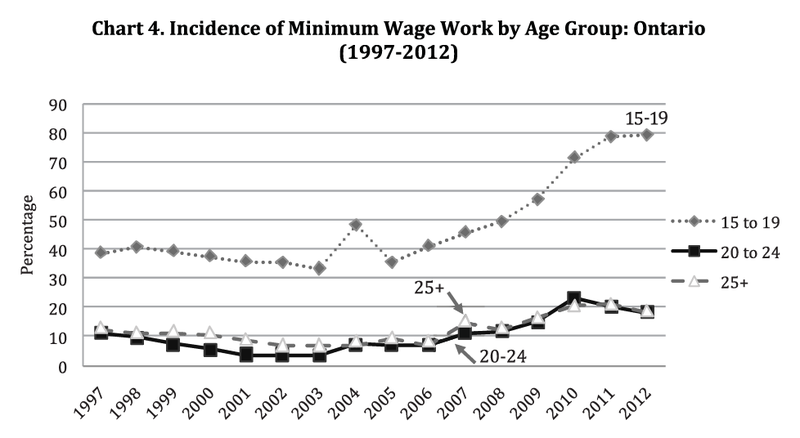 Incidence of minimum wage workers in the 20-24 age group and 25+ age group was stable until 2007, when a slight increase appears for both groups. 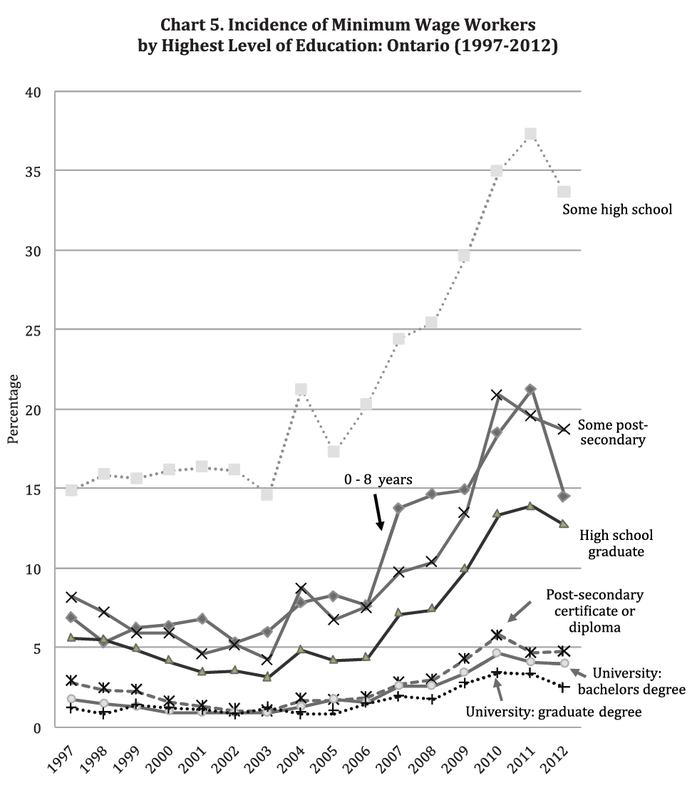 Incidence of minimum wage work among people with some high school education (i.e., not completed high school) increased significantly from 2006 until 2011 (Chart 5). This group was consistently more likely to be employed at the minimum wage than all other groups, for every year during the 1997-2012 period. The likelihood of being employed at the minimum wage drops generally with additional years of education. The only exception is the group with 0-8 years of education which is less likely to be employed at the minimum wage relative to the group with some high school education. Women are slightly over-represented in the minimum wage group. Women constituted 50.3% of the Ontario workforce in 2012 but their share of the minimum wage group was 58.3% (see Table 10). The incidence of recent immigrants in the minimum wage workforce, defined as having arrived in Canada within the past ten years, has risen sharply since 1998 when it was 6.9% to 19.1% in 2011 (see Table 9). This nearly three-fold increase in the incidence well exceeds the increase in incidence for all workers which rose from 6.3% to 9.0% over the same period. The incidence of minimum wage work in Ontario has also risen for a group defined as Disadvantaged (defined as disabled, recent immigrant, member of a female lone parent family, Off-Reserve Aboriginal Person or an unattached individual 45 to 64 years old) from 7.4% to 11.2% over the same period (Table 9). The majority of minimum wage earners are dependent working age children (a son or daughter living in a family home), whereas a minority of minimum wage earners are couples (Table 1). Of the minimum wage earners that hold a couple status, the majority have a spouse who is employed. 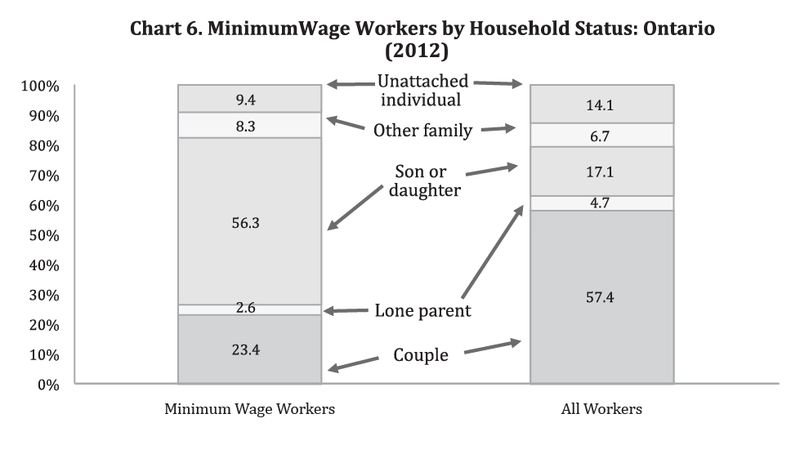 Sons or daughters living in the family home are overrepresented as they constitute only 17.1% of the workforce but form 56.3% of the minimum wage workforce (Chart 6). Couple households are the largest underrepresented group: they are 57.4% of the total workforce but only 23.4% among the minimum wage workforce. Nearly seventy percent of minimum wage earners work part-time, i.e., less than thirty-five hours per week (Table 2a, 2b, 2c). Only thirty percent of minimum wage earners work full- time hours, i.e., thirty-five hours or more per week. The largest group of minimum wage earners, one in three, works between fifteen and twenty-nine hours per week. The proportion of all workers that work full-time hours, i.e., thirty-five hours or more per week, is 76.1%, whereas the proportion of minimum wage workers that work full-time hours is 30.9% (Chart 7). The proportion of minimum wage workers that work part-time hours, less than 35 hours per week, is 69.1%, whereas the proportion of all workers that work part-time hours is 23.9%. Ten percent of minimum wage earners are union members or covered by the collective agreement (Table 3a). The majority of minimum wage earners, 70%, are permanent status employees but this means that 30% are employed on a temporary status, a figure that exceeds the share of temporary status workers in the workforce as a whole at 12.9% (Table 4). Thus, minimum wage workers are two-and-a-half times more likely to be employed in a temporary job category such as seasonal, contract, casual, etc. The proportion of minimum wage relative to median wage was flat during 1997-99 at about 46% as both the minimum wage and the median wage remained flat. From 1999 until 2003 the minimum wage remained frozen while the median wage was rising in an improving economy. This caused the ratio of the minimum wage to the median wage to drop to roughly 41%. Thereafter, from 2003 until 2010, this ratio rose steadily to 51% as pre-announced increases in the minimum wage took effect and median wages did not grow as fast. Since 2010, minimum wage has remained frozen while median wages have been rising modestly, causing the ratio to drop to 49%. 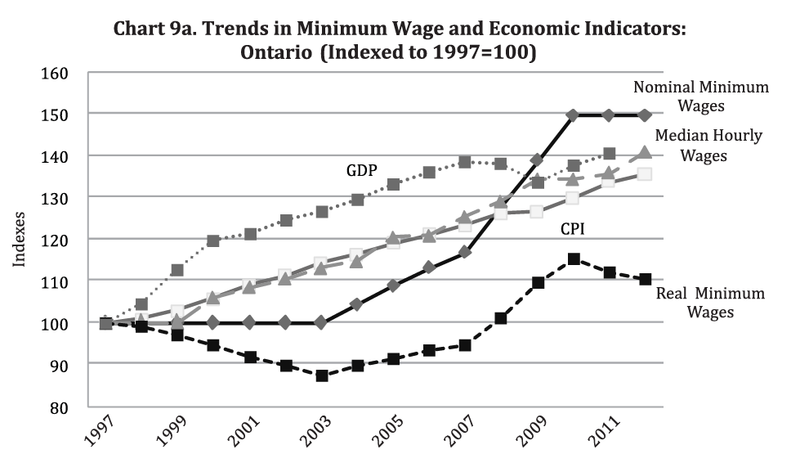 Ontario minimum wage relative to other economic indicators such as change in CPI, GDP growth, productivity, etc. The nominal minimum wage, which is the minimum wage in current dollars unadjusted for inflation, did not grow at all from 1997 until 2003 (Chart 9a). From 2003 until 2007, the nominal minimum wage grew at a rate comparable to other indicators such as median hourly wages, the CPI and the GDP. From 2007 until 2010 it grew at a faster pace than other economic indicators. At its peak in 2010, the real minimum wage had made up all of the ground it had lost since 1997 and was roughly 15% above the 1997 level. Since 2010, the real minimum wage had declined relative to other economic indicators but in 2012 it was still 10% above its 1997 level. Chart 9b shows the real and nominal minimum wage relative to unemployment and labour productivity. While the nominal minimum wage has risen 50% since 1997 and the real minimum wage 10% over the same period, unemployment is lower (to 90% of its 1997 level) and labour productivity has also risen by almost the same amount, about 10%, above its 1997 level. Both the nominal and real minimum wages have risen higher than the LIM relative to 1997 levels. In 2012, the LICO measure was 30% higher than its 1997 level (Chart 9c). In comparison, the real minimum wage, adjusted for inflation, rose by only 10% over its 1997 level even though the nominal minimum wage rose by 50% since 1997. A quick overview of minimum wage levels and mechanisms for revision are shown in Table 8. Ontario at $10.25 an hour is similar to B.C., but is slightly higher than Quebec at $10.15 an hour. Among the provinces, Manitoba at $10.45 and Nova Scotia at $10.30 an hour are now higher due to increases that went into effect in 2013. The other three provinces (Newfoundland & Labrador, New Brunswick and Prince Edward Island (PEI)) and two Prairie provinces (Alberta and Saskatchewan) are all below Ontario's current minimum wage. In terms of schedule of increases, the only province not to have revised its minimum wage since 2010 is Newfoundland but its government has now scheduled two increases to take effect in 2014 and 2015 respectively. All other provinces have reviewed the minimum wage in 2012 or 2013. Nunavut and the Northwest Territories (NWT) have not revised their minimum wage since 2011 but the Yukon revised it in 2013 and plans to do another revision in 2014. The mechanism for introducing a revision in the minimum wage varies across provinces. In Ontario and B.C. it is up to the Government to use its discretion in deciding when to revise and by how much. In five jurisdictions (Manitoba, New Brunswick, Newfoundland, PEI and the NWT) the task is assigned to an independent body that recommends revisions to the government for implementation. In four jurisdictions (the Yukon, Nova Scotia, Saskatchewan and Alberta) an automatic formula is used to calculate increases which are then implemented by a fixed annual calendar. Although Nova Scotia has adopted an automatic formula, it also has retained an independent body to review the minimum wage annually and provide advice to government. Ontario's minimum wage at $10.25 an hour is higher than the federal minimum wage in the United States (US$7.25 or C$7.50 an hour) and slightly below UK's (£6.31 or C$10.36 at current exchange rates) (Table 5). But it is lower than Germany's proposed €8.50 an hour (C$11.75), Australia's (AU$16.37 or C$15.75) and New Zealand's (NZ$13.75 or C$11.61) minimum wage. Mechanisms for setting minimum wages vary widely across the OECD countries. But it may be worth noting that in some countries such as the UK and Australia there are wage commissions that operate as an ongoing organization. Australia uses a judicial model by appointing full-time judges, with some part-time members, to the Fair Work Commission. Britain on the other hand appoints members from all stakeholder groups to its Low Pay Commission. These commissions have wider mandates, which justify their full-time operation on an ongoing basis. Source: Computed from Labour Force Survey (LFS) by Ministry of Finance: Special tabulation made for the Ontario Minimum Wage Advisory Panel. Data for this chart can be found in Table 10. Data for this chart can be found in Table 1. Data for this chart can be found in Table 2a, 2b, 2c. Data for this chart can be found in Table 11. Note: 1997 is used as a reference year as the Labour Force Survey implemented a significant revision in that year. 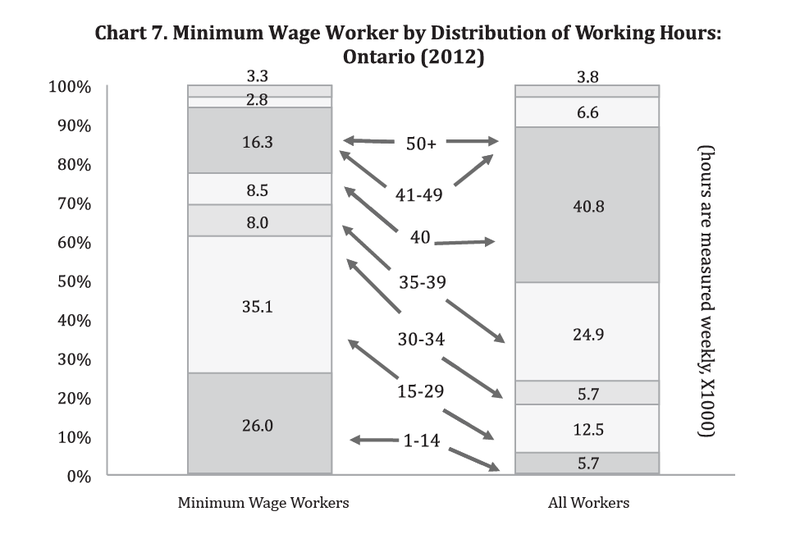 Source: Computed from Statistics Canada Data by Ministry of Finance: Special tabulation made for the Ontario Minimum Wage Advisory Panel. Data for this chart can be found in Table 12. 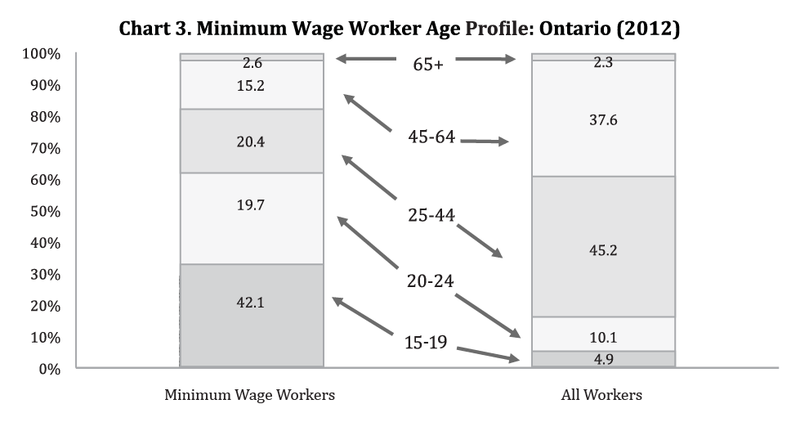 Source: Computed from Statistics Canada's survey of Labour and Income Dynamics by Ministry of Finance: Special tabulation made for the Ontario Minimum Wage Advisory Panel. Data for this chart can be found in Table 12b. [ 1 ] Statistics Canada computes an hourly wage for those who do not report an hourly wage, by dividing total income by the total number of hours worked. For a variety of reasons, this works out to be less than the minimum wage in Ontario ($10.25/hr) for some people. Note: Compiled by the Ministry of Labour using sources cited in footnotes for the Ontario Minimum Wage Advisory Panel. [ 3 ] US minimum wage was US$6.55 in 2008. [ 4 ] Germany currently does not have a national minimum wage; minimum wages are determined by collective bargaining agreements and are industry/sector-specific. A draft law on the introduction of a statutory national minimum wage has been passed and approval by the Federal government. The minimum wage will be introduced in 2015, and will come into full effect in 2017. National rate set by government/review body Yes Period not stipulated No obligation to consult social partners. National rate set by government/review body Yes Annually (In 2013) Consultation with only two social partners (Business New Zealand and New Zealand Council on Trade Unions) and other government agencies/ministries. [ 6 ] Ten US States index minimum wage to CPI and/or cost of living. [ 7 ] New Zealand has no set criteria for every annual review; however, the factors considered in the 2013 review were specified. $11.00 Mandatory review by Minister Last increase January 1, 2011. $10.54 Each April 1, minimum wage is adjusted based on changes to the Consumer Price Index (CPI). Last increase April 1, 2013. Next increase: April 1, 2014 (amount TBD). $10.45 Independent body gives advice Last increase October 1, 2013. $10.30 The minimum wage is adjusted on or after April 1 each year to reflect changes in the CPI for Canada. Last increase April 1, 2013. Next increase: April 1, 2014 (amount TBD). Note: As of April 1, 2012, the general minimum wage was bench-marked using the Low Income Cut-Off (LICO) for a single person in a community the size of Sydney. $10.25 Ad hoc by government Last Increase March 31, 2010. $10.25 Ad hoc by government Last Increase May 1, 2012. $10.15 Formal review (not statutory) Last increase May 1, 2013. $10.00 Independent body gives advice Last increase April 1, 2012. $10.00 Independent body gives advice Last increase July 1, 2010. Scheduled increases: Oct. 1, 2014 ($10.25); Oct. 1, 2015 ($10.50). $10.00 Independent body gives advice Last increase April 1, 2011. $10.00 Minimum wage is adjusted annually based on changes to CPI and average weekly earnings. Last increase December 1, 2012. $9.95 Each September 1, minimum wage is adjusted based on changes to the CPI and average weekly earnings. Last increase September 1, 2013. Next increase: Sept. 1, 2014 (amount TBD). 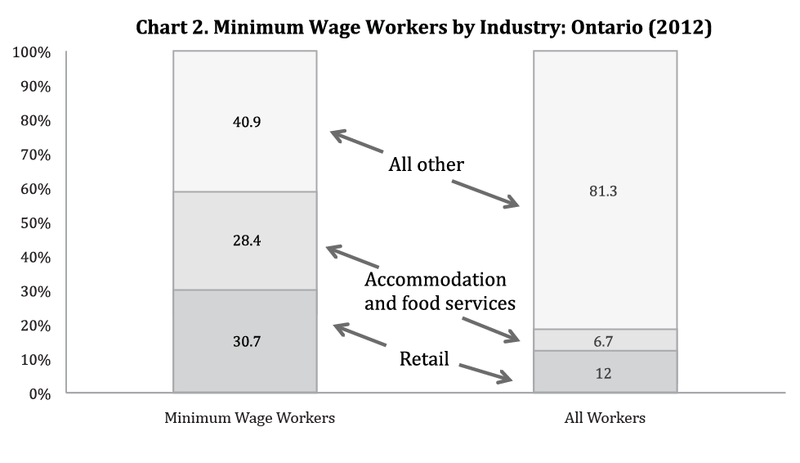 Source: Compiled by the Ministry of Labour for the Ontario Minimum Wage Advisory Panel. [ a ] Recent immigrant arrived in the past 10 years of the reference year. [ b ] Worker is either disabled, recent immigrant, member of a female lone parent family, an Aboriginal person or an unattached individual 45 to 64 years old. Source: Compiled by Ontario Ministry of Finance based on Statistics Canada's Survey of Labour and Income Dynamics. Source: Computed from Statistics Canada's Labour Force survey by Ministry of Finance. Source: Compiled by Ministry of Finance: Special tabulation made for the Ontario Minimum Wage Aadvisory Panel using Statistics Canada Data. [ i ] Carswell. (2012 –Release 2). Employment Standards Act, 2000: Policy and Interpretation Manual, Chapter 13: Minimum Wage. [ ii ] Ontario Ministry of Labour, Minimum Wage.